IP100 series NAS/iSCSI tower offers both NAS & iSCSI hybrid functionalities in a single system, providing users unparalleled flexibility by centralizing both file and block-level storage through IP network. Based on the 45nm Next-Generation Intel® Atom™ Microarchitecture, AIC’s IP100 series NAS/iSCSI RAID tower is a cost effective and power efficient IP-storage solution with targeted performance and low power consumption. - IP based storage management combines NAS & iSCSI functionality for centralized storage and storage consolidation. efficiency and security over the web. - Heterogeneous support for a broad range of network environment and protocols allowing data to be easily shared among different platforms. 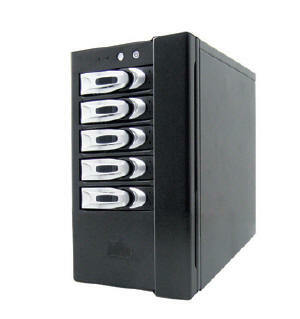 - Reliable disk based backup and recovery, along with Snapshot capability enable fast and reliable backup and restore.